Churchill Downs is named after John and Henry Churchill from whom Colonel Lewis Clark Jr., their nephew and president of the Louisville Jockey Club and Driving Park Association leased 80 acres of land. Churchill Downs replaced Oakland and Woodlawn, the two race courses that were previously built on the land and were closed down. Churchill Downs soon became the go-to place for thoroughbred horseracing and betting and still claims one of the highest ranks in the horseracing world today. The track was sold to a syndicate in 1893 and saw many changes, such as the shortening of the main race to its current 1? ?1/4 mile and the addition of the famous twin spire grandstand. Another change that was instituted was the adorning the winner of the Derby with a garland of roses, a tradition that began in 1895 and is still popular today. Churchill Downs was listed as a National Historic Landmark in 1986 and is one of the sport’s most prestigious racetracks. 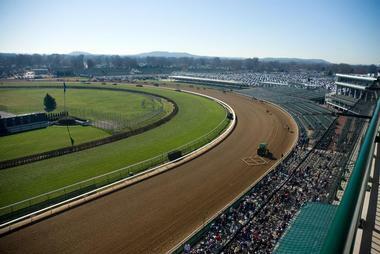 Churchill Downs spans 147 acres and can accommodate a capacity of up to 150,000 people on Derby day. The Derby is run on the main dirt oval track, which his one mile (1.6 km) in circumference and 80 feet wide, with a 7/8 mile turf track on the inside. 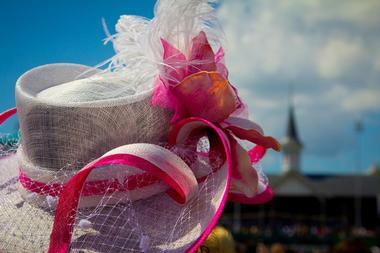 The most recognizable feature of Churchill Downs, however, is the twin spire grandstand. 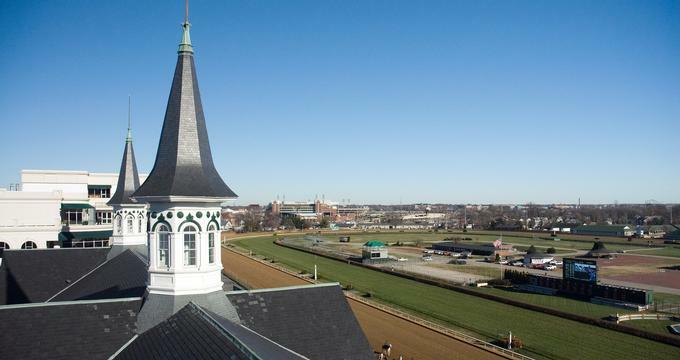 Designed by architect Joseph Baldez and built in 1895, the beautiful architectural feature of the twin spire grandstand is used as a symbol of Churchill Downs and the Kentucky Derby and is recognized the world over. Additional facilities at Churchill Downs include a newly renovated clubhouse with 79 luxury suites and beautiful murals depicting Kentucky Derby winners from 1875 to 2004. In addition to the world-class racetrack, the modern stables, and the contemporary clubhouse, Churchill Downs is also home to the Kentucky Derby Museum, which showcases the history of Churchill Downs and the famous Kentucky Derby and Churchill Downs. 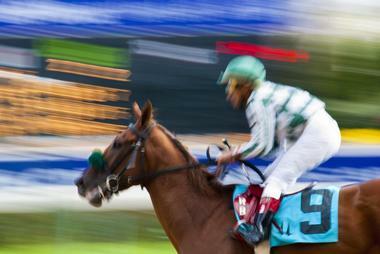 The museum features a range of informative exhibits that explore the training and racing of thoroughbred horses, as well as a state-of-the-art 360-degree movie theater that presents a short documentary about the Kentucky Derby called “The Greatest Race.” The Kentucky Derby Museum is open daily, year-round. The Kentucky Derby Museum is located within the racing track grounds and is dedicated to celebrating the heritage of the historic Churchill Downs Racetrack and the tradition, hospitality, and pride of the world-renowned Kentucky Derby. The Museum aims to engage, educate and inspire the community and visitors about the exciting sport of thoroughbred horseracing. 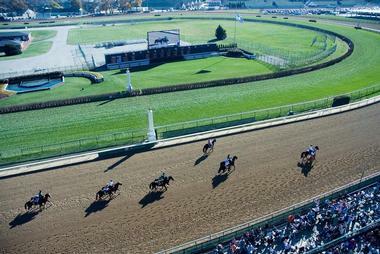 Churchill Downs is located at 700 Central Avenue in Louisville and is open every day of the week. There is a gift store located inside the Gate 17 entrance off the paddock that offers a broad range of officially licensed Kentucky Derby and Churchill Downs apparel, books, keepsakes, memorabilia, and gifts.